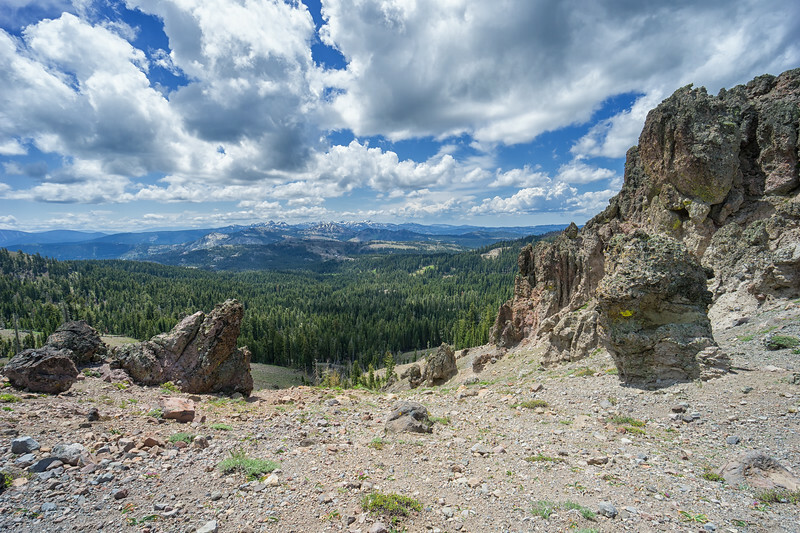 Hiking to the tallest peak near Truckee, California - Castle Peak. 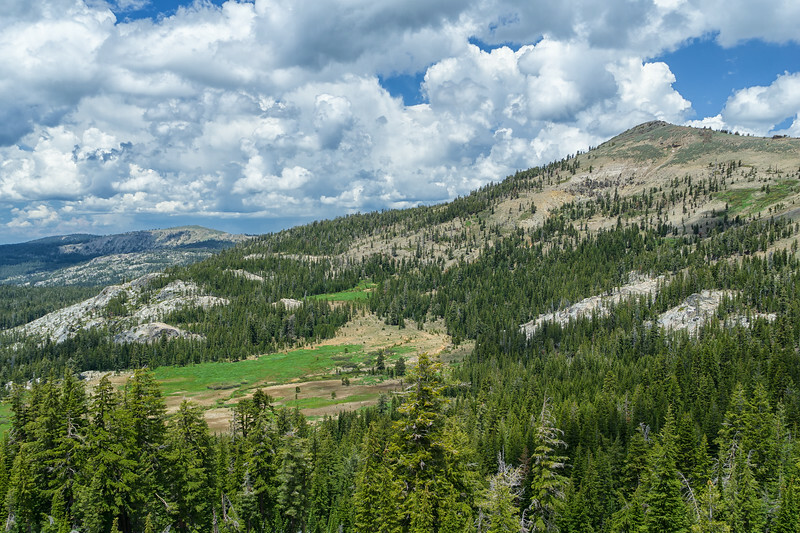 Part of the Pacific Crest Trail and fantastic views of the entire Lake Tahoe region. 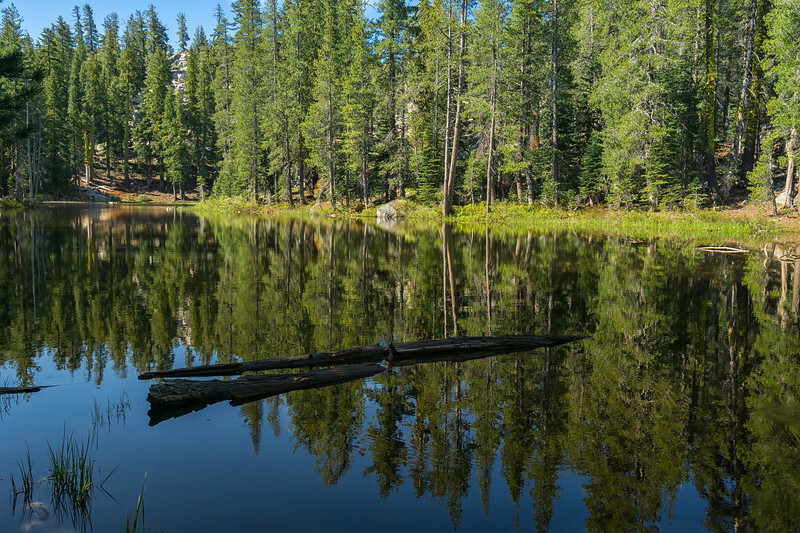 One of the small lakes at the start of the Castle Peak Trail (coincident with the Pacific Crest Trail). 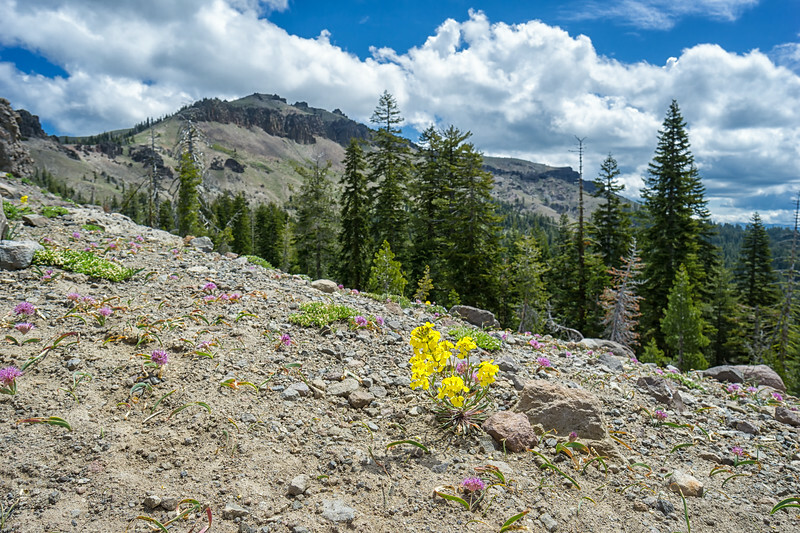 Wildflowers on the ridgeline looking at Castle Peak. 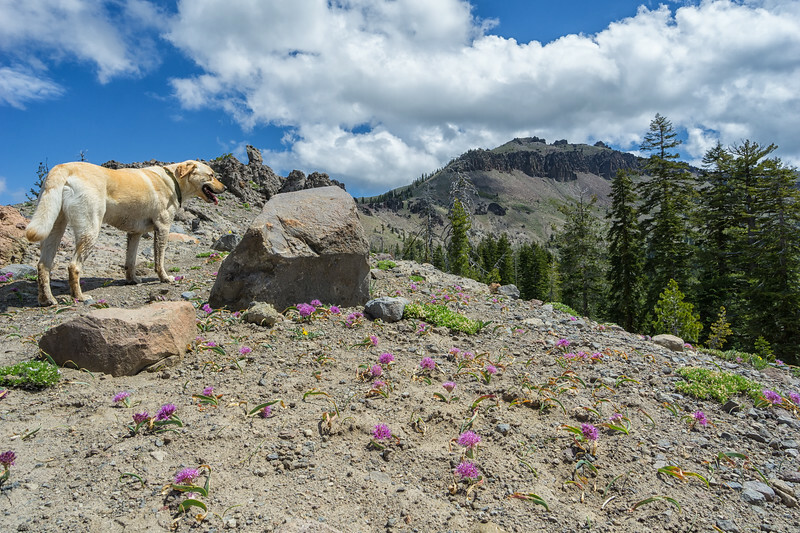 Charlie the Lab taking a break in the wildflowers before ascending Castle Peak, looming a half mile away. On the ridgeline to Castle Peak, looking west towards Castle Pass. On the east side of Castle Pass, before ascending Castle Peak. You can see the trail zigzagging up to the top, on the north side of the peak. 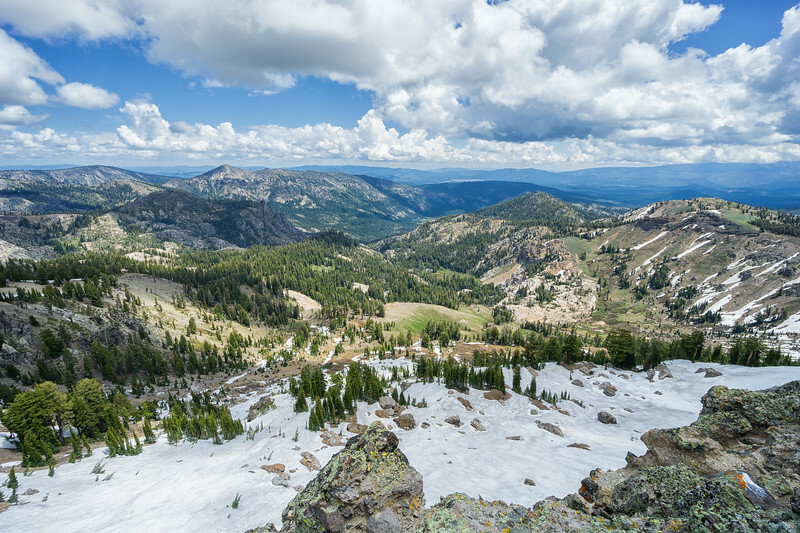 Castle Peak is volcanic in origin and is surrounded by interesting volcanic features. 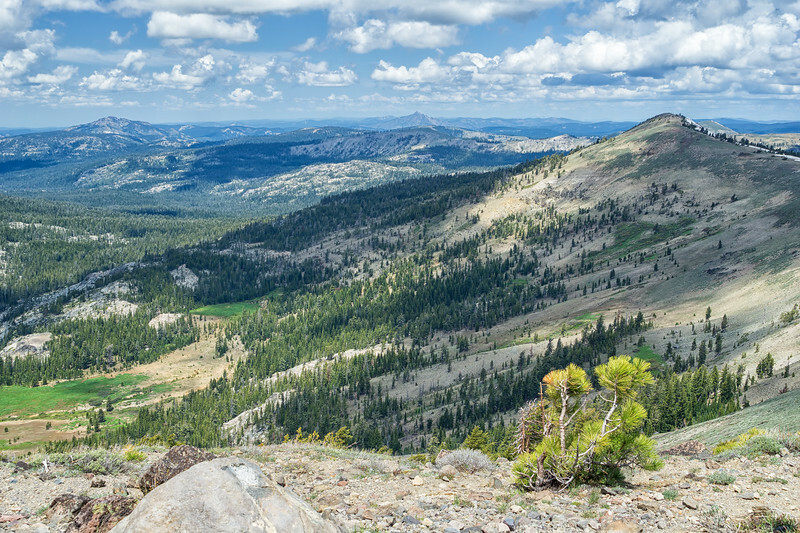 This is looking sout towards Sugar Bowl, Olympic Valley, and Desolation Wilderness in the distance. Looking west from Castle Peak. 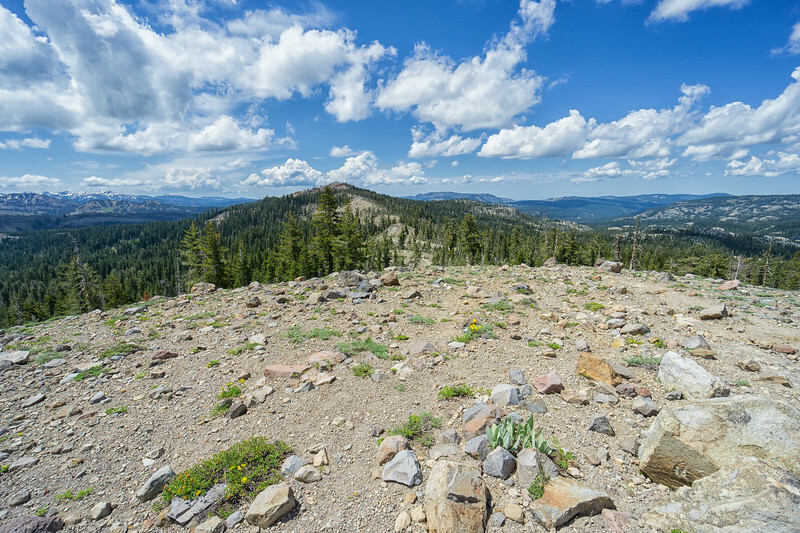 The view is bounded by Carpenter Ridge to the left, Donner Ridge to the right, and Boca Reservoir in the distance. Looking north from Castle Peak. 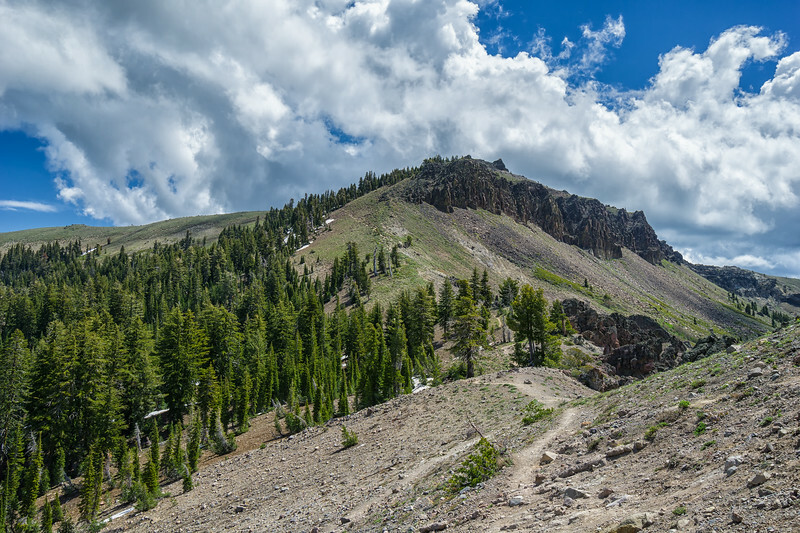 The ridgeline from Castle Peak goes north to Basin Peak. 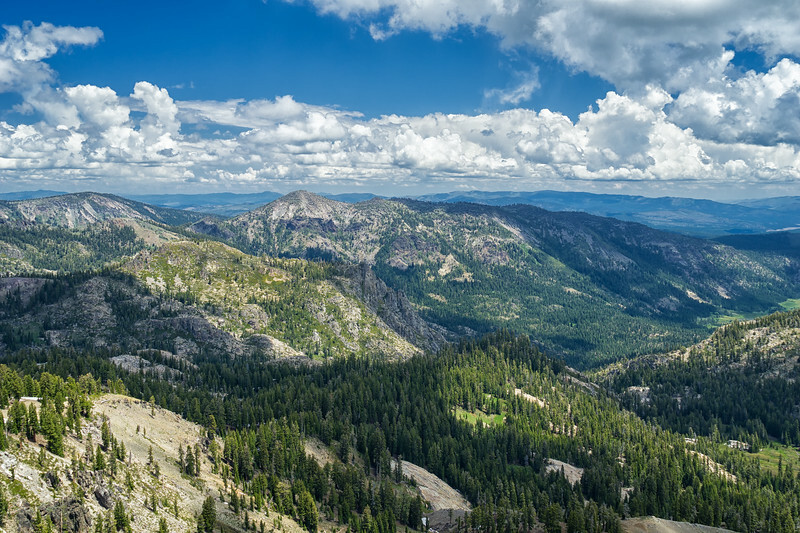 Sierra Buttes are visible left of Basin Peak, and Mt Lassen is further in the distance between Basin Peak and Sierra Buttes. Round Valley is in the foreground. Carpenter Ridge and Carpenter Valley, east of Castle Peak. Round Valley and Basin Peak from the trail ascending to Castle Peak. 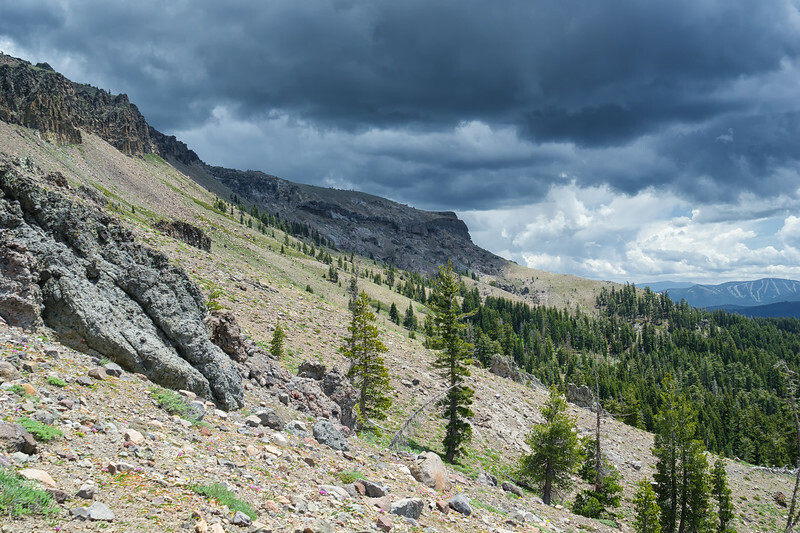 Thunderheads forming over Castle Peak. 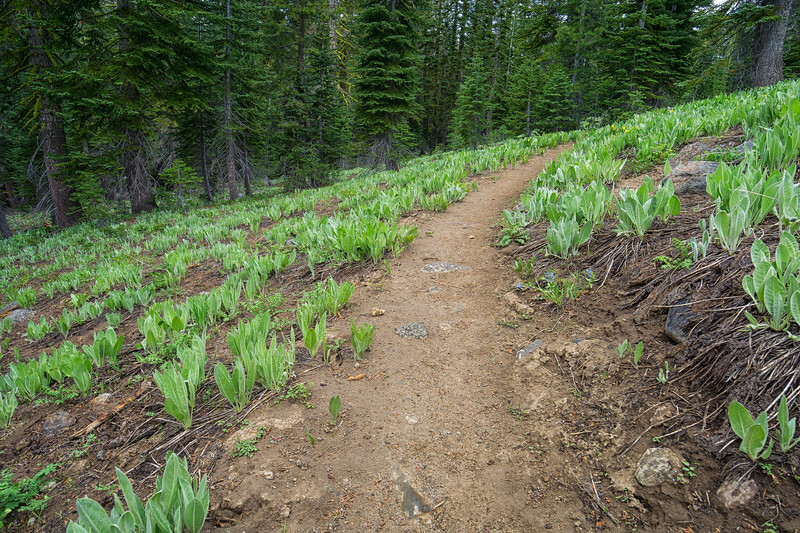 Mule's Ears line much of the trail through Castle Valley. 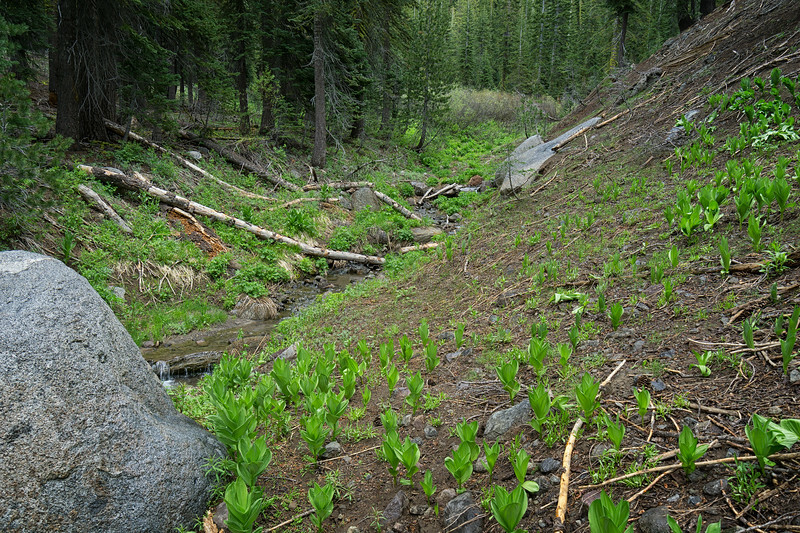 One of the stream crossings in Castle Valley. 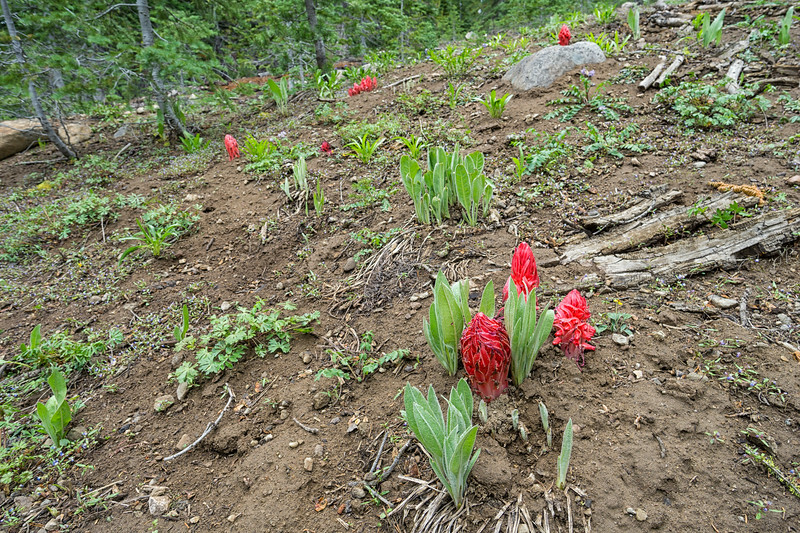 Mule's Ears and Snow Plants emerge in late spring/early summer in Castle Valley.